A boat carrying 264 migrants arrived in Pozzallo, Sicily, on the weekend. The migrants had been rescued by a fishing boat that towed it to the port in the province of Ragusa. According to the UN Refugee Agency UNHCR, there were 233 Eritreans aboard who had been held prisoner by traffickers for one to two years and had survived torture, abuse, and malnourishment. A boat carrying 264 migrants crammed together one after the other arrived at the port of Pozzallo, Sicily, after a fishing boat rescued it and towed it to the port. The migrants aboard had been three days at sea without food or water. They left their worn-out clothes and shoes aboard the boat, along with makeshift life jackets. Among the group of migrants were 40 women and 44 children, nearly all unaccompanied minors, as well as a newborn baby girl who was only 15 days old and had been born in Libya. The newborn's mother is a 19-year-old who had become pregnant after being sexually abused in a Libyan migrant detention camp. The fishing boat rescued the migrant boat, despite the fact that, according to Italian Interior Minister Matteo Salvini, responsibility for the rescue operation had initially been taken by the Maltese authorities. "Valletta, as usual, is trying to hand off migrants to our country," Salvini said. The migrants arrived in Pozzallo in the late evening. Nearly all of them were from Eritrea and had departed last Thursday from Misurata, Libya. They were held for hours on the boat, while the only ones authorised to disembark were women and children. Five Egyptians accused of human trafficking were stopped by Italian police. The suspected traffickers are accused of facilitating illegal immigration. According to witnesses interviewed by the Ragusa police, the five suspects were part of the crew of the boat that was rescued by the fishing boat, which towed it to the Sicilian port. 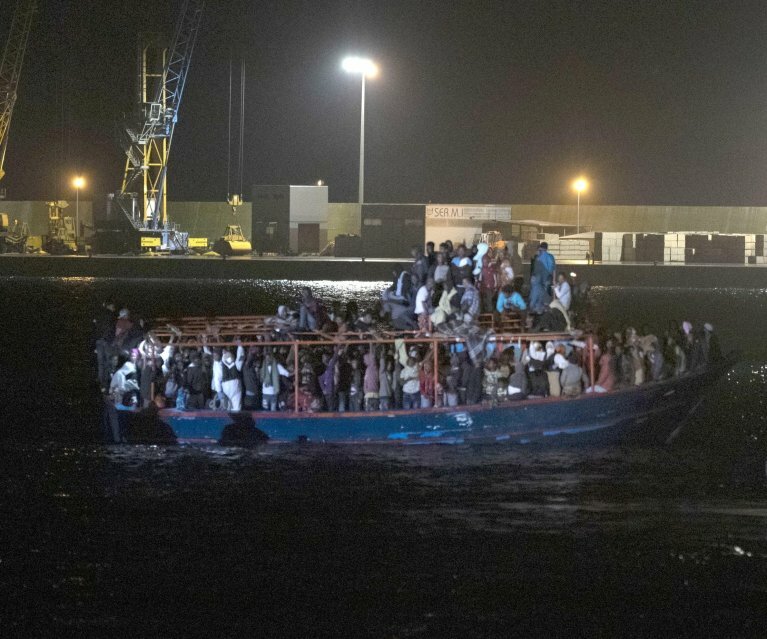 Each migrant allegedly paid 1,500 euros to reach Italy, for a total profit of nearly 400,000 dollars for the traffickers. The five suspects were fingerprinted and profiled by the Ragusa forensic police prior to being brought to jail. The UN Refugee Agency UNHCR in Italy, on its Twitter profile, said that the 264 migrants who were brought to Pozzallo had departed from Misurata in Libya on November 22. It said there was a 15-day-old newborn baby girl among the group and that she had been born without medical assistance in a hangar. It said there were 233 Eritreans who had been held prisoner by the traffickers in Libya for one to two years, and that the migrants had suffered torture, abuse, and malnourishment, as well as paying a ransom twice. It said the refugees were on a rickety boat at sea for three days, without food or water. "They are miraculously alive in Pozzallo. Others, however, disappeared at the same time. Rescue at sea is essential, together with a safe and predictable mechanism for docking," UNHCR Italy said.